Display: Red bright LED display. We are a leader in offering a best quality of Laboratory Rocker to our clients. These rockers are made up of best quality metal and are available in different designs and sizes. The machine is specially designed as per clients specifications. 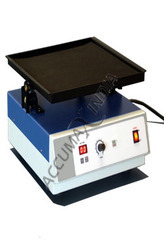 We are a topmost provider of Gel Rocker which is used in chemistry laboratories. It can be used quite easily and works in excellent manner. It is found in different dimensions. This is scientific product used in science labs. It gives excellent performance for long time period. There is huge demand for our range. Experts ensure that our range is in tune with global industry standards. These GEL Rocker is specifically optimised with the ideal rocking speed and tilt angle for blot washing, gel staining and detaining applications, Speed: 0-60 Oscill/min fitted with digital timer 0-99 minutes, with controllable speed. 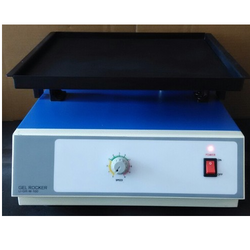 Gel Rocker is widely used in laboratory testing applications. This product is available with two convenient platforms; one is Rocker platform and another is double platforms. We have made it user friendly by giving it electronic touch pad control system. Gel Rocker as the name suggests is rocking and widely used as useful equipment in laboratory applications. Can be used for many applications like gel staining, culture aeration, bathing, blottingmembranes etc.A metal platform with non-slip rubber mat moves in a gentle 'See Saw' motion.The movement is controlled precisely with a DC motor.Cushion and rubber feet prevent unit from 'slipping'.